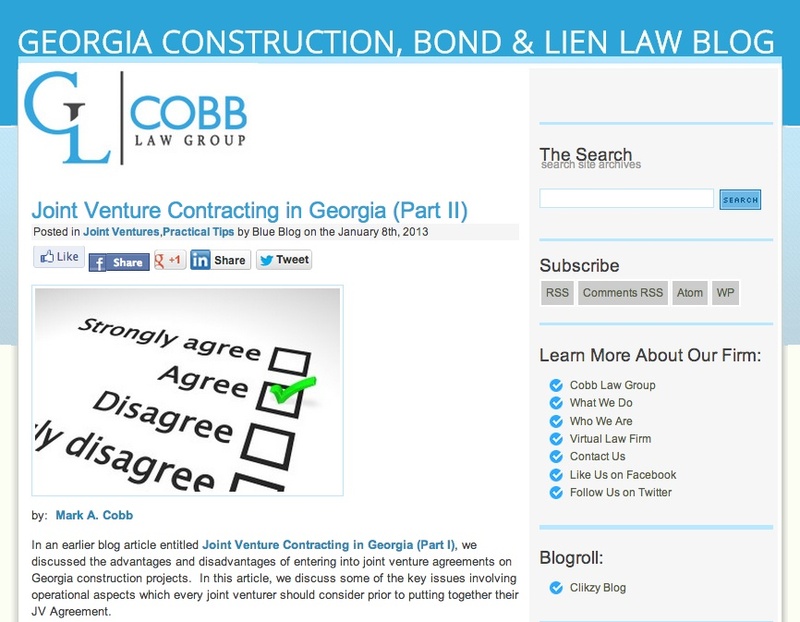 You can certainly grasp Cobb Law Group‘s blog foundation without thinking too hard: the Georgia Construction Bond and Lien Law Blog clearly is immediately relevant to Georgia-based contractors and sub-trades. Mark Cobb and guest contributors share observations, insights and solid factual information about contract law and the often arcane (but vitally important) lien law rules. This posting excerpt from Oct. 2012 shows the depth of information you can find in the blog, where Cobb describes how his practice’s payment bond lawyers needed to file payment bond claims within a few days. Because the government projects are slow-paying, our clients are asking us to timely file their claims against the projects’ payment bonds. 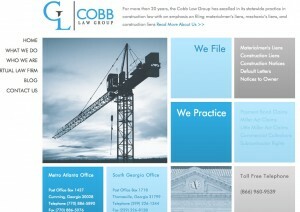 As mentioned, above, our Georgia payment bond lawyers have initiated six new claims so far this week. All six of these claims were approaching the deadlines in which a valid claim could be made. two of the payment bond claims have not yet received a response (but we are hopeful they will get paid quickly!). So, what exactly does this little study show? Slow-pay is not “no-pay”, but you will probably have to exercise your legal rights to make a claim against the payment bond in order to get paid; in four out of our six examples, 2 have been paid and 2 are promised to be paid. Thus, our clients have already released two payment bond claims, and two others have been suspended pending payment by the surety or the general contractor. That’s recovery of 2/3 of the cases in a matter of hours after bringing a payment bond construction lawyer on board. Prime contractors understand the government’s slow-pay mechanism; however, as the entity posting the bonds, it is the prime contractors’ credit rating which is affected by a subcontractor’s or materialmen’s claim; thus, it is in the best interest of the general contractor to pay the third-tier supplier or subcontractor rather than face increased premiums in the future. We firmly believe that if our clients had not made their payment bond claims before the statute of limitation ran, they would not have received payment. Making these claims is a wonderful tool in the arsenal of Georgia subcontractors and suppliers to make sure that payment is made. The blog covers other issues, including reporting on client successes, safety and other relevant topics — all useful to build relationships. This is an undoubtedly useful resource for Georgia contractors, sub trades and related professionals and owners (and outsiders considering doing business in Georgia), and is a worthy 2013 Best Construction Blog competitor. This is one in a series of reviews of nominees for the 2013 Best Construction Blog competition. I’ll do my best to review all nominees, providing some positive comments and hyperlinks. Nominations are open through Jan. 31. You can nominate your own blog or one you like. Here is the nomination form link. Previous articleConstruction marketing’s simplest rule: Why is it so hard to follow? Next articleBest Construction Blog competition: Gould Design, Inc.
Would you like to share your marketing success story?